The 25th Season Jerseys have a slightly different cut to previous seasons - please make sure to check our size guide! For sizes XL and above, we would recommend going one size up compared to your previous purchase. 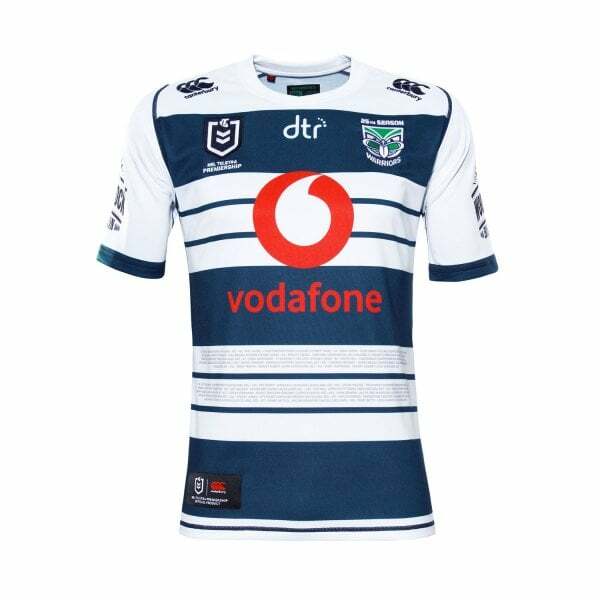 This jersey belongs in your collection for two reasons; it shows your support for the Vodafone Warriors and it celebrates their 25 years in the NRL. Two birds, one jersey, get yours now. Show your allegiance to the Vodafone Warriors in Canterbury’s On Field Heritage Jersey. The perfect symbol of support for serious fans, this striking jersey in black and white looks great on the field and is designed to boost training performance. It’s made from 100% Polyester Interlock and has a VapoDri finish that keeps you cool and dry by wicking away moisture from the fabric. It’s finished with team and sponsor logos and a special commemorative logo at the chest celebrating the Vodafone Warriors 25 years in the NRL. A quality garment with all the construction and design features of the team’s own heritage jersey and definitely one for the collection.